A quick update; Pomatomus is coming along swimmingly! 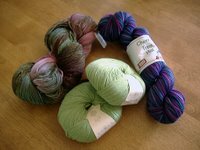 I love the Lorna’s Laces yarn. It’s soft and yet very strong (for those K2 Tbl’s) and I’m really happy with how the pattern isn’t fighting with the lace work. I tried a new cast on for the first time in decades and I really like the appearance. It was a little awkward at first but I think I may start using this for all my socks. A little more stash enhancing happened this week too. Some Cherry Tree Hill Supersock, a lovely handpainted Ebay find, and some Rowan 4-ply Soft. I’ll need to find patterns worthy of the first two, the Rowan is destined for the Lovely Lace socks in the Spring Interweave. Here are some “Pom” pics, I can’t believe I’m actually getting these done while the KAL is still on. 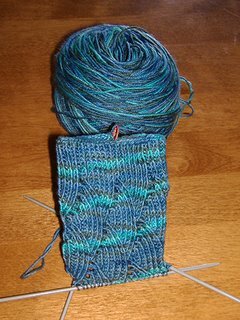 I have one more pattern repeat to go before the heel and the pattern became easier very quickly – I’m already planning a second pair! The pomatomus looks beautiful. And your new yarns are pretty too. Have fun with those! Your Poms are stunning! Can’t wait to see the finished pair! Karin – I’ve added you to Count Your Socks – thanks for joining us! Hi from Austria! Your Pom is coming along so beautifully, can’t wait to see the pics of it when it’s finished. And oh, all that gorgeous yarn! Have fun knitting!